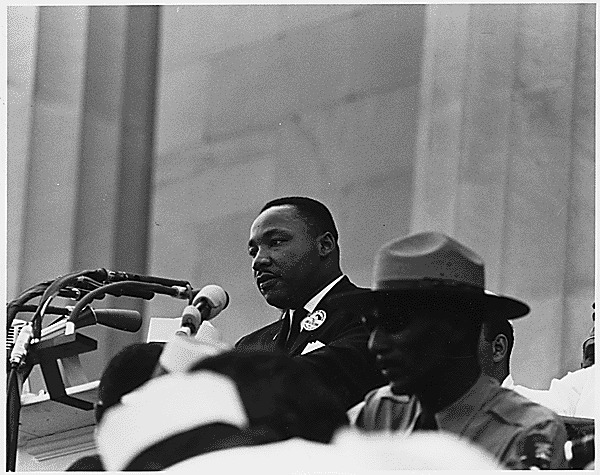 Histories of the National Mall | Martin Luther King Jr.
Martin Luther King Jr., “Martin Luther King Jr.,” Histories of the National Mall, accessed April 22, 2019, http://mallhistory.org/items/show/90. Dr. Martin Luther King Jr. was a minister and African American civil rights leader. On August 18, 1963, he delivered his famous "I Have a Dream" speech on the steps of the Lincoln Memorial during the March on Washington for Jobs and Freedom. A plaque on the steps of the Memorial marks this event. In 2012, the Martin Luther King, Jr. Memorial was dedicated on the National Mall to commemorate King's work and his vision for equality and national unity. National Archives at College Park - Still Pictures. View original photograph. Dr. Martin Luther King Jr. was an clergyman and major figure in the African American Civil Rights movement of the 1950s and 1960s. He was awarded a Nobel Peace Prize for his work against racial prejudice. He was assassinated on April 4, 1968. Learn more about King from the Martin Luther King, Jr. Center for Nonviolent Social Change.